If you have a baby, then you are eventually going to need to potty train them. It is a right of passage that they are going to need to go through before they end up using a fully-fledged toilet! Of course, in order to potty train them, you are going to need to have a potty. With thousands upon thousands of them on the market, it can be pretty difficult to track down a quality one. That is why we have taken the liberty to put together this list. On this page, you will find five of the best potties around. When we crafted this list, we tried to go for a nice blend of quality and budget. This means that there should be a potty for absolutely everybody to be found on here! This is a very stylish potty. It has been constructed from the highest quality polypropylene. This means that it is going to last an incredibly long amount of time. Polypropylene is less likely to take on awful smells too. While it is important that you do clean a potty fairly regularly, it does mean that as long as you clean it, you are not going to end up with something which really ruins the space in your home. The design of the BABYBJORN Smart is actually rather compact. This means you should easily be able to find an ideal space for it in your home. It comes with a few nifty features too. For example, there is a splashguard which ensures that there are going to be no spills when your child is using this potty. The materials that have gone into making this potty, as mentioned before, are of the highest quality possible. This means that you do not have to worry about the potty breaking on you. This is a fantastic potty. This is because it is so much more than a potty. It has been designed to encourage good toilet habits. 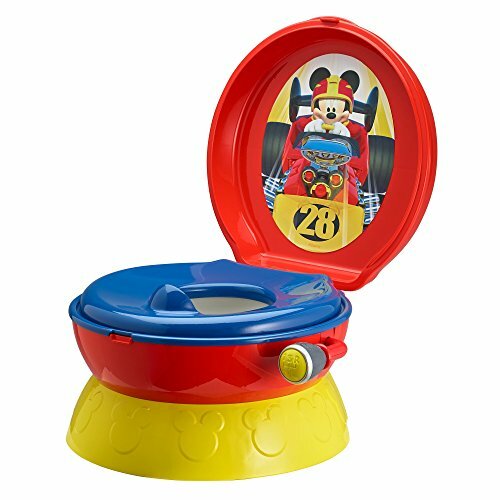 The design of the Fisher-Price Learn-to-Flush potty means that you will probably end up using this for the whole of your baby’s potty training. First and foremost, there is a handle to ‘flush’ the potty. Of course, it is not functional. However, the idea is to encourage your child to establish good bathroom habits right off of the bat. Remember, if you use a standard potty, it does not have this feature. This means that by the time your child graduates to a toilet, they are going to need to learn how to use the handle too. You will be surprised at how long something like this will take to teach a child! It does make a flushing sound though, which is great. Finally, the seat of this potty is removable. You will be able to place it on most standard sized toilets. This means that it should be easy to graduate your child from the potty to this toilet! Of course, the whole thing has been made from baby safe materials and it is incredibly durable. This should last for the whole duration of your child’s potty training. Third on our list is this offering from Disney. Sure, it does not look like a conventional potty, however, try not to think about that too much. The idea of a potty is to have something which looks attractive to your child. You want to encourage them to use the potty. This is where the First Years Disney Baby Mickey Mouse comes into play. It looks visually appealing. As with the other potties on this list, it has been made from baby-safe materials. It has also been designed to ensure that mold and mildew do not form on the potty. However, it is advised that you regularly clean it, just to be sure. 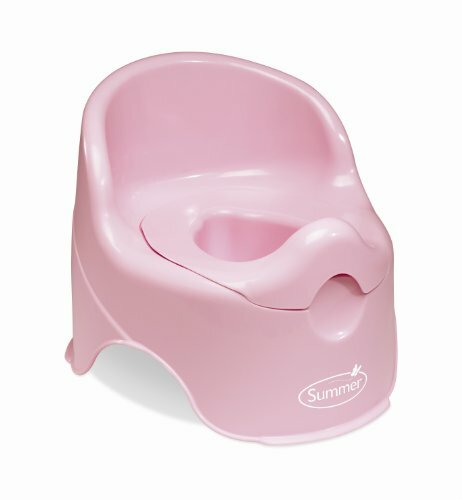 One of the things that we really loved about this potty, other than the design, is the fact that the lid closes up. Eventually, your child is going to graduate to using a full-size toilet. They may be a touch too small to climb up onto it, however. This is where this potty comes into play. When you close the lid up, it becomes a nice, sturdy step stool. The child can also use this step stool when they are trying to wash their hands. Remember, they are never too young to teach them good bathroom habits! This potty is slightly different from others on this list. This is because this potty has been designed to ensure that your child gets the best possible posture. This is great during the early stages when you are looking to ensure that your child is orientated correctly. 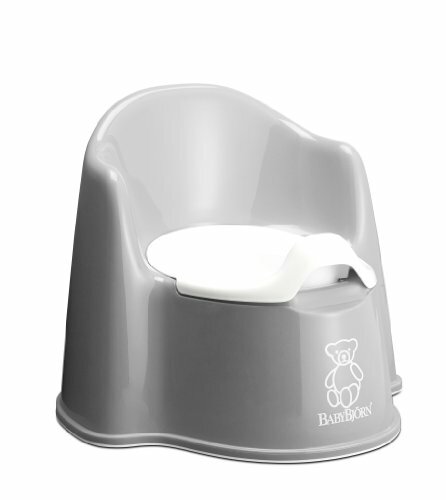 The premium materials used in the BABYBJORN Potty Chair ensure that the potty is going to be easy to clean. You won’t even have to worry about it staining after months and months of use! We are pretty confident that this is a potty chair which will last the full duration of your child’s potty training. Finally, this is a nice, comfortable potty chair for your child. The back support means that it should be able to support children of most ages. It comes equipped with a good quality splash guard which helps to prevent accidents. In fact, if you use this, then the messes are not going to occur at all. The nice design ensures that it is going to be easy to clean up. It is non-irritating for your child, which means they are going to love using it! Remember, always read through as many reviews as possible before you purchase a potty. This way you can be sure that you are ending up with something that is of a high quality.